Housing costs consume majority of disposable income in B.C. Once British Columbians pay for essential costs such as food, taxes and child care, nearly half of their leftover income is consumed by housing, according to a new tool that measures home affordability. And for a quarter of B.C.’s residents, mainly those in expensive cities, preliminary findings suggest more than two-thirds of disposable income goes to shelter costs. “Now that’s extreme. Can you imagine, with the amount of money left after (necessities), you now have to spend 70 cents on the dollar just to put a roof over your head and make it functional?” said Paul Smetanin, president of the Canadian Centre for Economic Analysis, a Toronto-based research and data firm. Smetanin’s firm recently unveiled the Shelter Consumption Affordability Ratio (SCAR), which he says is the first index to measure affordability using more factors than just housing prices or mortgage rates. SCAR also examines what people face every day to run their homes, including utility bills, maintenance costs, and the price of transportation to get to and from work. “Housing costs are much more than a mortgage. They are the cost of making a home operational,” Smetanin said in a phone interview from Toronto. The index subtracts essentials — such as health care, child care, taxes, food and clothing — from household income, and determines what portion of the leftover money is devoured by combined housing costs. Residents of Nova Scotia and Prince Edward Island spend the most on housing (46 cents and 44 cents respectively) of every dollar of income left over after purchasing necessities. British Columbia was tied with New Brunswick in third, with 43 cents of every dollar eaten up by housing costs. There are big, regional differences driving these conclusions. In the Maritimes, affordability is affected by many factors including utility rates, transportation costs and low incomes. In B.C., it is driven by one factor alone — the high cost of mortgages and rents. But the findings merely provide provincial averages, and anyone who lives in B.C.’s urban centres likely spends much, much more of disposable income on housing. “(Forty-three cents on the dollar) doesn’t really describe the pain in B.C.,” Smetanin added. 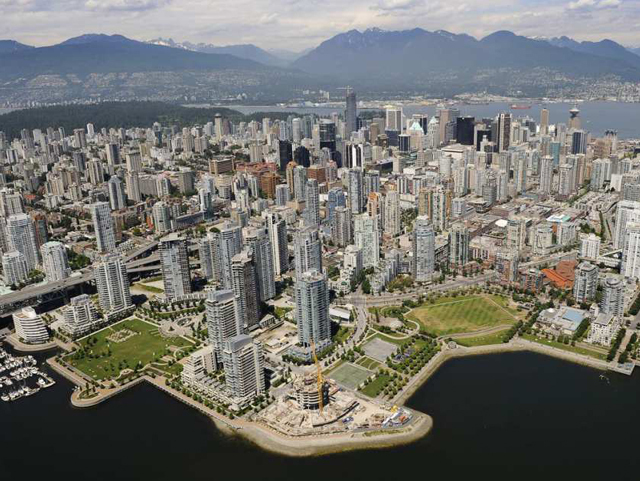 He has done a preliminary analysis — which he hopes to flesh out in the future while working with Vancouver City Hall — that suggests housing consumes 70 cents of every dollar left over after necessities for a quarter of B.C.’s population. Most of those households, the data suggests, are urban and lead by people under the age of 45. B.C.’s affordability crisis started to surge significantly in 2007, Smetanin said. The solution to this countrywide problem will differ province by province, and will require all levels of government to work together. “There is no silver bullet. It is a complex problem and you need well-informed governments and policies. And there is a big gap in government ability to actually understand the problem,” he said. City hall hopes to use findings from the conference to reset its Housing and Homelessness Strategy, which was not to expire until 2021 but requires new ideas given the region’s growing affordability crisis. The city’s refreshed housing strategy is scheduled to reach council early next year. The two-day Re:Address summit kicks off Oct. 26. It’s invite-only, but there are public events through the week.